Landslides are a natural process that removes material from hills, mountains and coastlines. Landslides are common in New Zealand and can range from small events to damaging large scale events. Landslides remove material from hills, mountains and coastlines. Landslides are common in New Zealand and can be small events or damaging large events. Some landslides move whole mountain sides, taking millions of cubic metres of material, at up to 200 kilometres per hour. Others are shallow or slow, moving only a few centimetres a year. Deforestation has had the largest impact on the stability of hillsides. Clearing land for farming has increased landslide activity by about seven times its natural rate. Road construction and subdivision earthworks can also destabilise slopes and increase landslide rates. regolith landslides – one of New Zealand’s most widespread types of landslide. These occur when the loose rock and soil above bedrock slides. Often large numbers of these slides will occur at the same time during rainstorms. submarine landslides – occur offshore on the continental slope. These can be bigger than those seen on land and even trigger tsunamis. Each year local councils, roading authorities, private landowners and railway operators spend millions of dollars clearing slips from roads and railway lines. It is a never-ending task – there are always more floods or earthquakes to come, and there is plenty of rock and soil waiting to tumble down. In general, landslides are more common in New Zealand than many countries because of the terrain and less stable conditions. However, landslides cause few deaths in New Zealand because there are few settlements in mountainous areas and the population density is relatively low. Some landslides move whole mountain sides, suddenly. Others are small or slow, moving only a few centimetres a year. Clearing forest has had the most impact on how stable the land is. Clearing land for farming has increased landslide activity. Building roads and subdivision earthworks can also increase landslide rates. 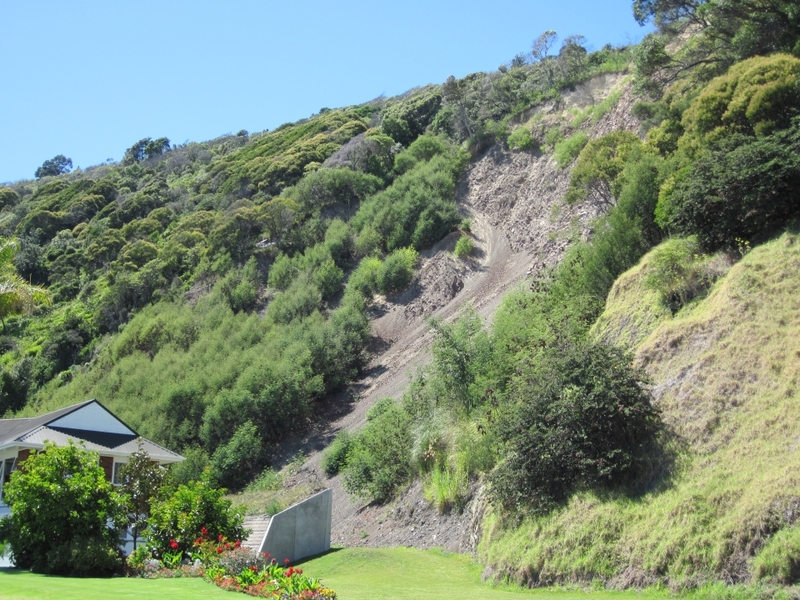 regolith landslides – one of New Zealand’s most widespread types of landslide. These occur when the loose rock and soil above bedrock slides. Often lots of these slides will occur at the same time during rainstorms. submarine landslides – happen under the sea. These can be bigger than those seen on land and even start tsunamis. Each year millions of dollars is spent clearing slips from roads and railway lines. It is a never-ending task – there are always more floods or earthquakes to come, and there is plenty of rock and soil waiting to fall down. In general, landslides are more common in New Zealand than many countries because of the steep land, weak layers and high rainfall. However, landslides cause few deaths in New Zealand because there are not many people living in steep, mountain areas. You could find out if and where there has been a landslide in your local area and what caused it. 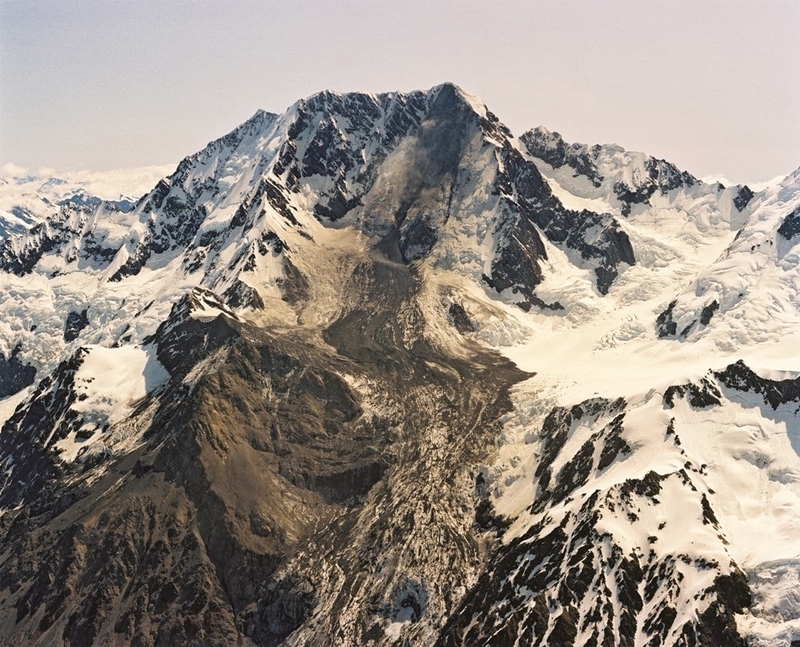 A massive rock avalanche changed the height of New Zealand's highest mountain, Aoraki Mount Cook, in December 1991. Can you find out about other large rock avalanches in New Zealand? Image: Loyd Homer, GNS Science. Landslides are common in New Zealand. This landslide is in Whakatāne. Can you find out what large landslides there have been in New Zealand recently. Image: LEARNZ. 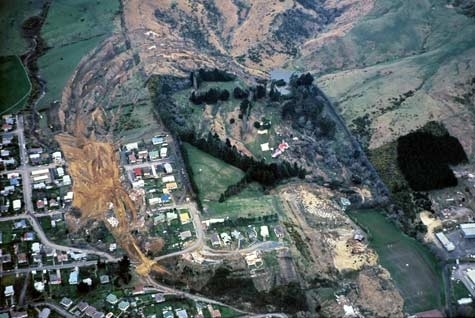 One of New Zealand's most well known landslides was the 1979 Abbotsford landslide in Dunedin which left 69 houses uninhabitable. What type of landslide was this and was anyone hurt? Image: GNS Science. 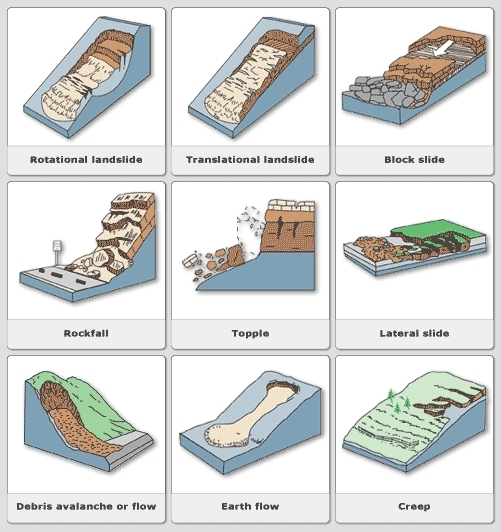 There are different types of landslides. Sometimes landslides can be a combination of different types. What are the most common landslides in New Zealand? Image: United States Geological Survey. Art work by Margot Johnson.